Today marks the opening of the inaugural TIFF Next Wave Film Festival for youth age 14-18. Previously known as the Sprockets Toronto International Film Festival for Children, TIFF divided the children's festival into TIFF Kids for 13 and under, and TIFF Next Wave for high school-age youth. Films screened include Amir Bar-Lev’s Re:Generation Music Project, Muriel Coulin’s 17 Girls and Aurora Guerrero’s Mosquita Y Mari. The closing night film will be Matthew Lillard's directorial debut Fat Kid Rules the World with Lillard in attendance. In addition to screenings, the festival will host various workshops, panels, the TIFF Next Wave Set Design Challenge, Future Frames and Games, and other fun activities for young people. The 1st TIFF Next Wave Film Festival runs until Saturday, May 12 at TIFF Bell Lightbox, 350 King Street West. Toronto – TIFF unveiled today a diverse slate of daring and thought-provoking film programmes and special events to take place during the inaugural TIFF Next Wave Film Festival. Running from May 10 to 12, 2012 at TIFF Bell Lightbox, the Festival invites youth aged 14–18 to delve into the world of cinema and life behind the lens. This first edition kicks off with the return of the successful Battle of the Scores — a high energy musical showcase where high-school indie bands battle it out as they perform their original score live to films from Jump Cuts, a short film competition open to Ontario students from grades 9–12. Hot off the heels of its South by Southwest Film Conference and Festival (SXSW) Audience Award win, Fat Kid Rules the World (2012) is the Closing Night film of the TIFF Next Wave Film Festival, with director Matthew Lillard (acting credits include Scream, SLC Punk! and The Descendants) and actor Jacob Wysocki (Terri) in attendance. Based on K.L. Going’s award-winning novel, Lillard’s directorial debut is a touching and hilarious film that follows the journey of an overweight teen through high-school terror as he is unexpectedly drawn into the world of punk rock. The Festival is steered by the TIFF Next Wave Committee, an advisory committee made up of 12 youth dedicated to bringing quality film programming and film related events to youth across the city. The Committee includes a diverse range of visual artists, aspiring filmmakers, dancers, writers and film lovers. Other highlights include: Amir Bar-Lev’s music documentary Re:Generation Music Project (2012), a behind-the-scenes account of the creative collaborations between five world-renowned DJs/producers, including Skrillex, Mark Ronson and DJ Premier, as they remix, recreate and re-imagine five traditional styles of music in collaboration with musical legends ranging from The Doors to Erykah Badu; Delphine and Muriel Coulin’s Cannes Critics Week winner 17 Girls (2011), a subversive French dramedy, based on a true story that follows 17 high-school girls who make a pregnancy pact with dreams of creating a utopian society of their own; Aurora Guerrero’s feature debut Mosquita Y Mari (2012), which recently premiered at Sundance Film Festival to rave reviews, is a tender and intimate exploration of the complexities of an unexpected relationship between two young Chicanas as they deal with social expectations, insecurity and sexuality; and Mathieu Kassovitz’s riveting La Haine (1995), featuring a young Vincent Cassel in a landmark of contemporary French cinema that offers a gripping reflection of head-on racial tensions in a multi-ethnic Parisian suburb. For all film synopses, see below. 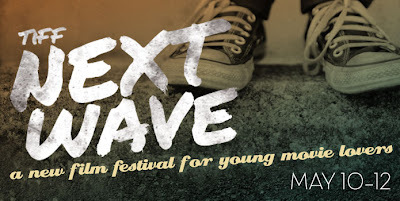 Also announced today is the TIFF Next Wave Set Design Challenge which takes place all day Saturday, May 12, in the main-floor gallery at TIFF Bell Lightbox. Several established culturally invested youth groups from across the GTA will participate in this DIY Hollywood Backlot set design challenge under the guidance of industry professionals. Visitors will be able to interact with the finished sets once the challenge is completed. TIFF Members and the general public may also purchase tickets to school programme screenings subject to availability. Tickets for the TIFF Next Wave Film Festival go on sale to TIFF Members today, and to the general public on April 17. Prices range from Student $9.50, a Student Saturday day pass $15.00, Adult $12, Senior $9.50, Children (13 and under) $8.50 and School Programme $8.00. For more information on screenings and activities or to purchase tickets, please visit tiff.net/nextwave, call 416-599-TIFF (8433) or 1-800-599-TIFF or visit the box office at TIFF Bell Lightbox.